St Petersburg to Moscow (and visa versa) on the inland waterways of Russia continues to be popular in spite of the difficulties placed in the way by the country’s bureaucracy. 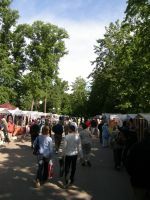 It is a great holiday, an eye opener, and, up to a point, a very relaxing way of seeing literally the inside of Russia. Why the query about relaxing? In order to get the most out of the trip one needs to be active and make the most of the stopovers along the 685-mile journey between the two great cities taking six nights. The package includes three further nights at each end, adding to the community spirit of the whole trip and saving a great deal on hotel bills. It is during the dark hours, and they are not that dark in the popular tourist season from May to September, that your ship cruises through 18 locks and the world’s largest fresh water lake. The trip is tiring but most rewarding. You don’t go direct. Your ships diverts in Lake Onega to Kizha Island, famous for its wooden architecture and near Moscow to the ancient city of Yaroslavl on the Volga. 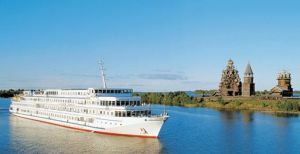 AERBT chose Viking River Cruises for the cruise, experts and very experienced with the problems of dealing with the Russians. They even sort out the visas and using British Airways make your welcome to the city of Peter the Great very easy and relaxing. At the other end there is not a rush to get off the ship (unlike deep sea cruising) and lunch is provided before departure if your flight is in the afternoon. Likewise a morning arrival. The whole trip is a fully inclusive arrangement including most of the off ship tours, a visit to the ballet, and some enthralling musical entertainment. Also part of the package are talks on the places visited, a Russian speaking course (not attempted) and a series of lectures on the Romanovs, communism and its fall, and the Russia of Gorbachev and Putin. The aftermath of the fall of the Tsar is called the “Civil War” and WWII as “The Great Patriotic War”. 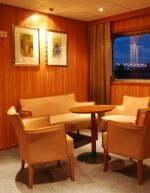 If you are used to big ship cruising Viking is in some ways a culture shock, but a pleasant one. The ships used on this particular journey hold around 210 people and have about 106 crew. The cabins are smaller than deep sea vessels, usually with showers, and just as well equipped. Balconies would not fit in but large windows are provided. The two spacious suites on board are worthy of any cruise liner and have jetted hot tubs. There is a doctor on board but no hairdressers or spa. Everyone dresses casual all the time and the busy schedule does not allow for wallowing under treatment. There is a shop on board for essentials, a library, a small boutique and two lounges with a resident pianist, in this case a graduate from a conservatoire, very proficient in Tchaikovsky and jazz. Our ship was the Viking Kirov, one three ships used on the St Petersburg to Moscow programme and completely remodelled for the 2009 season. Reputed to cost US$6m the work was handled by a Russian shipyard, unlike the previous year when sister ship Surkov was upgraded in Finland. Essentially the 35-year old vessel, originally build in East Germany, was gutted. Although looking somewhat severe externally once inside it is as modern as can be with full air conditioning, a comprehensive video and film presentation unit and very nicely presented bars and dining room. All the cabins have internet facilities, flat screen TVs, fridge and safe. There is an elevator too. English speaking Filipinos supply the resturant service which is on par with say Princess or NCL. Quality mostly western style food. After three days in St Petersburg the Neva River emerged at daybreak into Lake Ladoga, freshwater and 124 miles long and 75 miles wide, the home of salmon and sturgeon, the source of Russia’s famous caviar. Next up the Svir River linking the lakes of Ladoga and Onega 140 miles of pine forest that provide cover for bear, elk and lynx. A curious lunchtime stopover was the village of Mandrogy, a sort of crossover between a purpose-built outlet store and a typical Russian riverside village. It rained somewhat. And on into Lake Onega and a diversion far to the north brought us to the little island of Kizhi, now a museum and the home of the Transfiguration Cathedral built in 1714 and restored. No nails are used at all. There is also a farmhouse, again in wood, an interesting example of how people lived and worked in a harsh environment 100 years ago. If you though that the Panama Canal consumed lives nobody knows how may people perished during the construction of the Volga – Baltic waterway in the late 1930s during the Stalinist era. Probably tens of thousands. Whilst there had been water links between Russia’s greatest cities from 1825 they were less than reliable Stalin was determined to make the waterways a commercial artery no matter the cost. Huge timber, fuel and coal barges still plough their way. Towns and churches followed, each with its idiosyncrasies and stories to tell. Seemingly busy markets with plenty of fresh vegetables from all over the world. The odd Jaguar spotted and the latest Mercedes, BMW and inevitable Toyota. Friendly coffee shops and smiling people. The Rybinsk Reservoir, man-made, flooded by Stalin, with the church towers still pointing skyward above the waterline. 700 villages were lost. A quick tour off the ship to Goritzy, a sleepy village and a fortified monastery visit. A huge complex will a cell for each monk. Russia of today is gradually rebuilding all these historical links. Another diversion this time Yaroslavl, part of the “Golden Ring” of provincial cities protecting Moscow and since the middle of the 19th century on the Trans Siberian railway line to the Urals and Vladivostok. There are supposed to be 170 churches in the city and they are just completing another one. Icons galore. Uglich is the last call before Moscow the town dating back one thousand years and popular as a retreat. There was the visit to the inevitable church but the history of the place is fascinating. Here was exiled the last, and seventh, wife of Ivan the Terrible, and here died in mysterious circumstances their son Dimitre soon after the Tsar’s own death. Puskin tells the story in Boris Godunov. And so up the Moscow Canal for the inevitable captain’s diner on the night before arrival and three days of sightseeing.